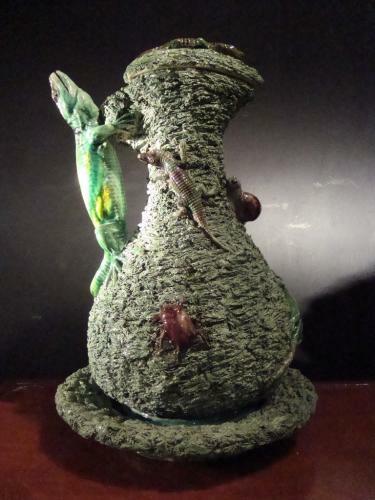 A lovely 19th c. Majolica Palissy ewer and cover featuring a large lizard handle, one further lizard, two beetles, two salamanders, and a moth or butterfly. All on a green mossy ground with cream interior and underside. Cover with a lizard forming the finial. Cream underside to cover with impressed maker's mark: M. MAFRA CALDAS PORTUGAL Manuel Cipriano Gomes (1830-1905) was the founder of the Mafra firm. Sometime during the mid-1800s, Gomes adopted the name "Mafra" after his home town and incorporated it in the mark of his pottery firm. Mafra introduced many technical as well as subject-matter innovations. He greatly enlarged the color palette, was the first to employ high-glaze mottled backgrounds of brown, or brown and green, and refined the techniques first developed by Bernard Palissy. He is also credited with developing an export trade in ceramics from Caldas. Mafra's renown caught the attention of King Fernando II, who both purchased and commissioned works for the royal collection. He dubbed the Mafra factory "Royal Supplier to the King" and even authorized use of the crown as part of the Mafra mark.